A Seattle-based startup has developed an innovative “skin closure device” that exhibits the anchoring strength of sutures and staples, but is nearly as easy to apply as a bandage. Called microMend, the device is performing well in clinical studies, and it may only be a matter of time before one gets stuck on you. 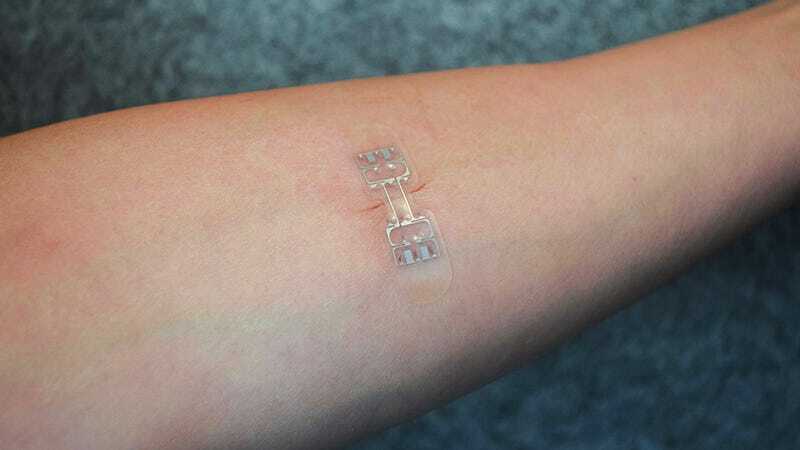 The device, developed by KitoTech Medical, consists of a thin adhesive strip and two arrays of tiny “microstaples” on either side. To apply it, a nurse or doctor places it across a wound one side at a time, allowing the microstaples to insert into the skin and align on either side of the gash. It’s apparently painless, or at least as painless as something can be when you’re dealing with an injury. Because the microstaples are packed closely together (5-10 mm apart) there’s virtually no gap in the wound, which lessens the chance of infections, inflammation, and scarring. No needles are required, which, in addition to reducing transmissible infections, is good for those who are squeamish about such things (raises hand). Tension is balanced across the entire wound on account of the way microMend is applied, a procedure similar to applying a bandage. The device covers the entire wound, so an additional layer of adhesive strips isn’t required as frequently as with sutures or staples. In some cases, a doctor can recommend that a patient remove the device by themselves at home. The device is the brainchild of KitoTech Medical CEO Dr. Ron Berenson, a med-tech entrepreneur who has launched several other startups, including Aequus Biopharma and HemaQuest Pharmaceuticals. As reported by Cici Zhou in Medgadget, KitoTech has finalized the design of the device, rounded up manufacturing partners, and completed a series of clinical trials. In studies done on pigs, an animal with very human-like skin, microMend worked just as effectively as sutures in closing wounds, while demonstrating “outstanding cosmetic results” when used to close 4.7 inch (12 cm) surgical incisions. During clinical trials with human subjects, microMend was three times faster to apply than sutures, and both healthcare providers and patients preferred the device to sutures and staples in 90 percent of cases. Patients said it was more comfortable to wear and have removed than sutures, and that it did a better job to facilitate healing. The device is primarily meant for dermatological and plastic surgeries, but it could also be used where speed and cosmetic results are required, such as emergency settings, or vascular, spinal, and laparoscopic surgeries. It could also work well among the elder set, where skin is sometimes too fragile to suture. The device is not recommended for closure of jagged wounds, infected sites, moist bodily areas (such as armpits or groin), and hairy skin, among others. Clinical studies are still ongoing, but microMend was recently showcased at the Annual Meeting of the American Society for Dermatological Surgery where it was met with positive reviews. The device won’t completely replace the need for staples and sutures, but it could dramatically reduce our reliance on these old-timey medical technologies.